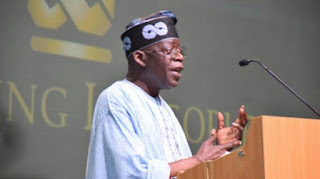 Bola Tinubu, a leader of the ruling All Progressives Congress (APC), has called on Nigerians not to accept the apology tendered by the Peoples Democratic Party (PDP). Speaking at a colloquium organised in his honour, Tinubu who clocked 66 on Thursday, said the APC would keep talking about the years of PDP’s “misrule”, and would ensure the party does not return to power. Tinubu said they are talking about “PDP’s stealing and looting” because the APC is against it. “If we are not talking about it, then what are the lessons for Nigerians? To them in that party, they will not come back,” he said. On Monday, Uche Secondus, national chairman of the PDP, apologised to Nigerians, saying his party made mistakes. Tinubu hailed President Muhammadu Buhari for his fight against corruption since he took over power in 2015. “There is a clear understanding here, there is a big difference between us and them; night and day,” he said. He said although it is not an easy task as there are still challenges, his party is reclaiming and reinventing Nigeria. He urged Nigerians to be more patient with the APC government.